Adventure Red-y is a medium-dark “retro” red. It’s a red. But it’s one of my favorites. 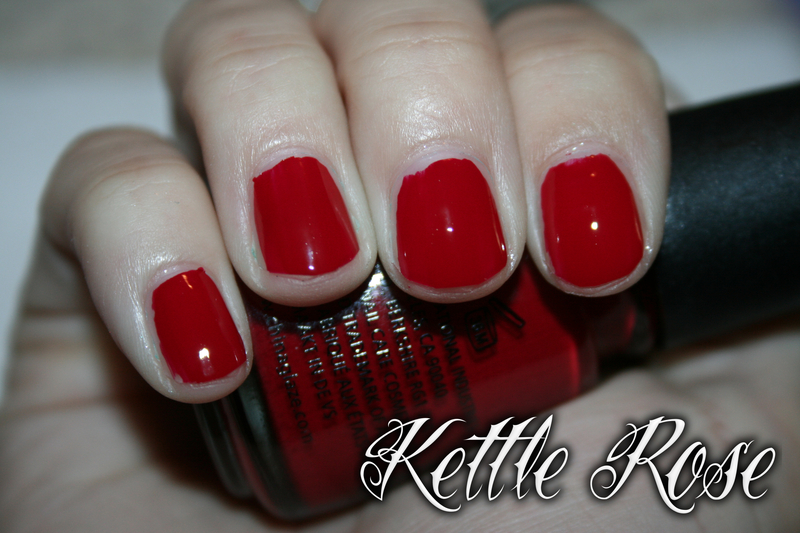 The formula is so flawless, and it’s opaque in almost one coat. So when I wear a red (which is rare) I’ll reach for this or Hey Sailor, depending on what kind of red I’m in the mood for. 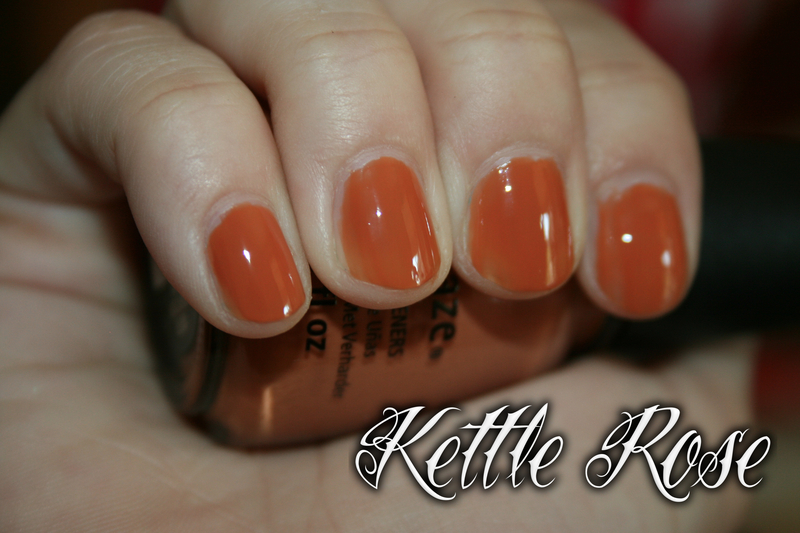 Desert Sun is a dusty, muted, dark pumpkin orange. I mean real pumpkin, not neon-candy-bucket pumpkin. It’s a touch brown. Gorgeous. Love this color. 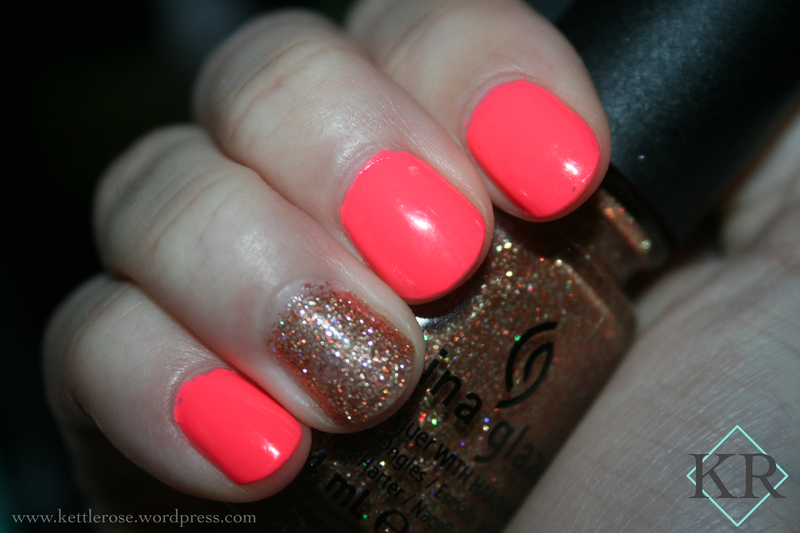 Opaque in two coats, wonderful formula, on par with most of China Glaze’s polishes. 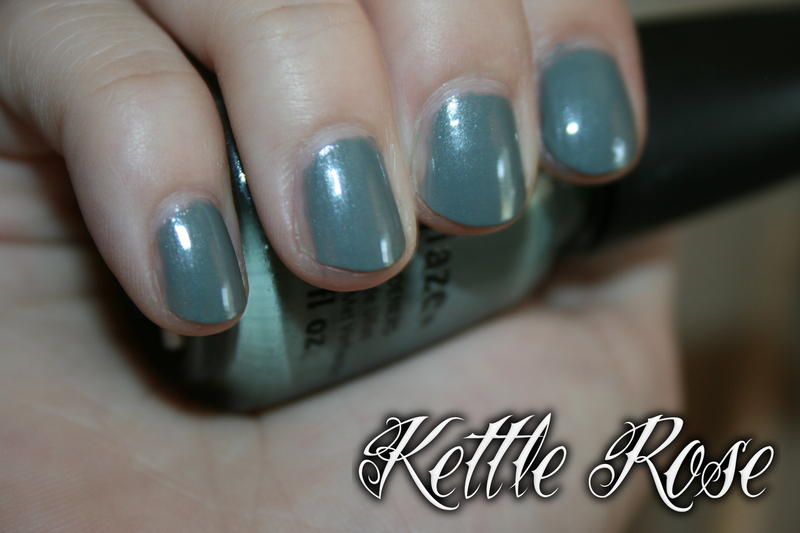 Elephant Walk is a slate grey shimmer with blue microshimmer. *sigh* This is the one I was most excited about. This is the one I haven’t really worn since swatching… Not for any reason except that I just don’t like it on me. Which is a bummer, because it really is a nice polish. 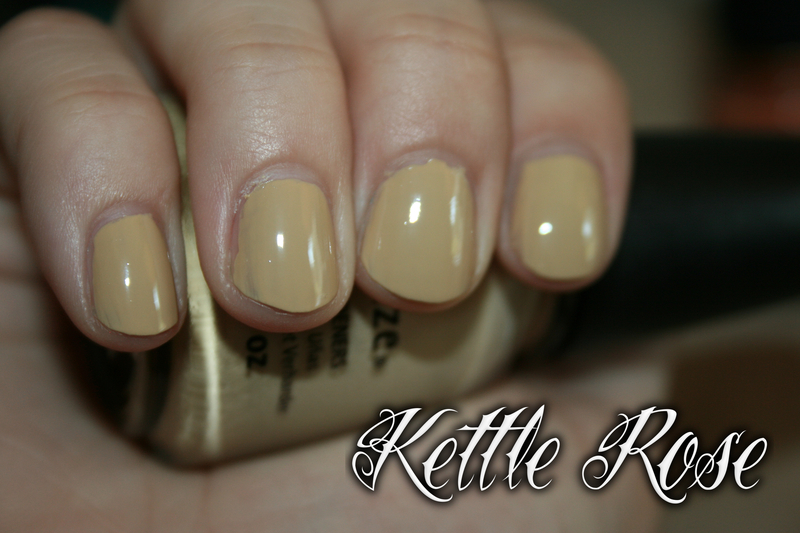 Good formula and I believe it was completely opaque and even in two coats. The shimmer was nice and behaved well. 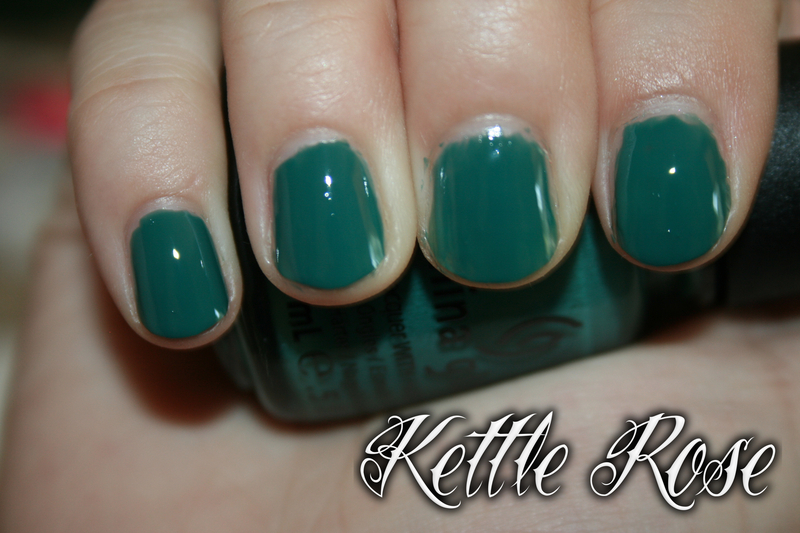 Exotic Encounters is a green leaning teal creme. Basically jungle green with a little blue in it. Opaque in two coats, but I did have slight bubbling from not waiting a little longer between coats. Really nice color, I think I’ve worn it twice, which considering my collection… is a lot. 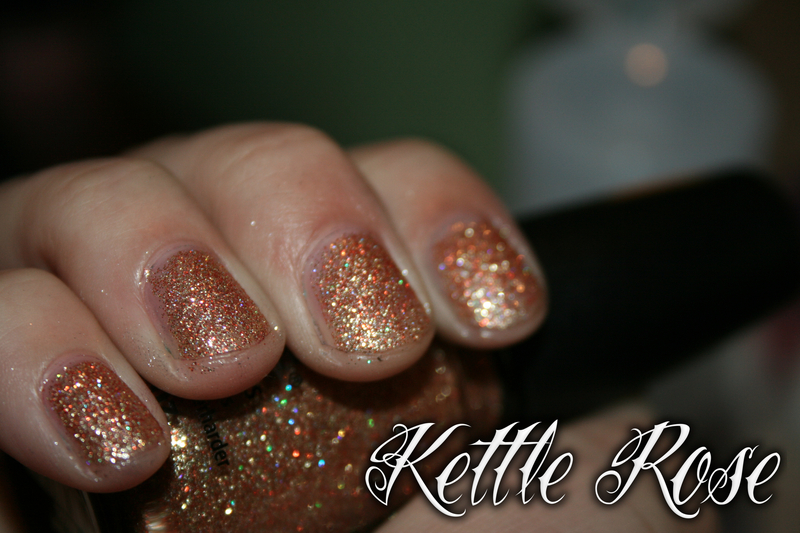 I Herd That is a golden glitter with bronze, yellow, and holographic glitter. It’s a golden glitter bomb! 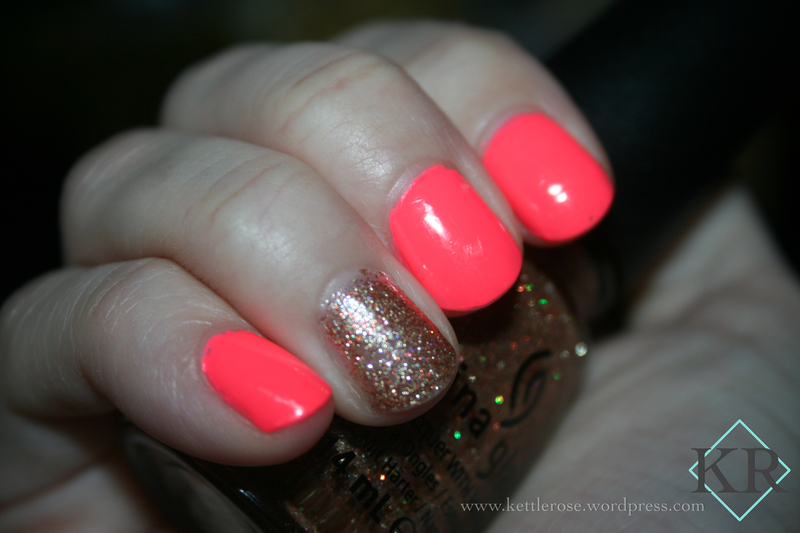 This look so, so good on my nails and skin. 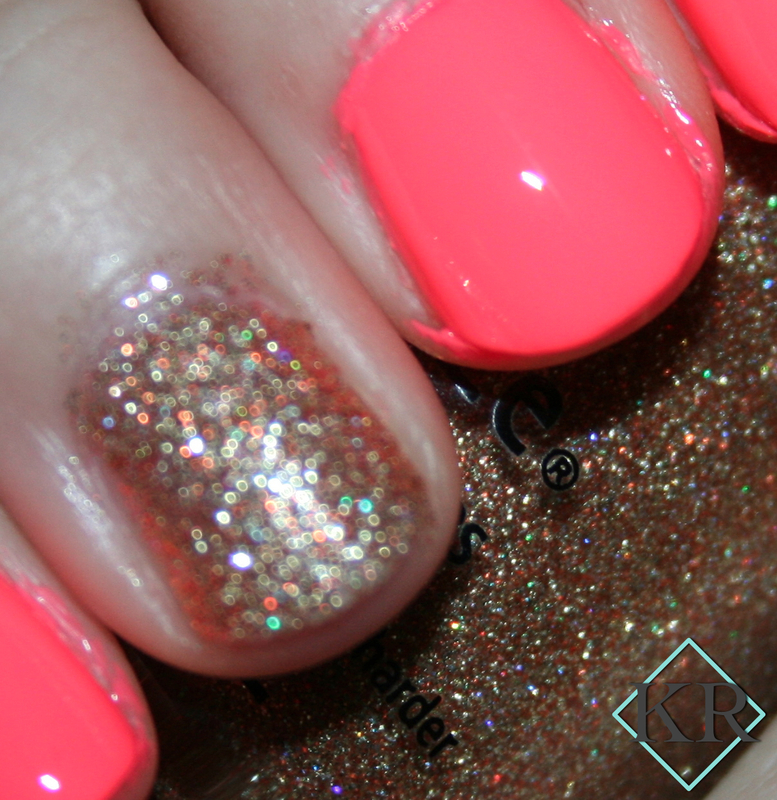 Applied like a dream, even for a glitter. Wasn’t too hard to get off, and it wasn’t too hard to make smooth. Jungle Queen is a muted purple, almost taupe, with wicked purple, red, and blue shimmer. Nearly opaque in one coat, though slightly uneven, as you can see on my ring finger. Apparently I missed some with that second coat… haha. Kalahari Kiss is a yellow-tan. A traditional camel color. Really nice, I used it as a base for a giraffe manicure and it worked really, really well. The manicure itself wasn’t so hot. Kalahari Kiss was a tad more picky, I’m assuming due to the yellow pigment, and required two coats for it to be mostly even and completely opaque. 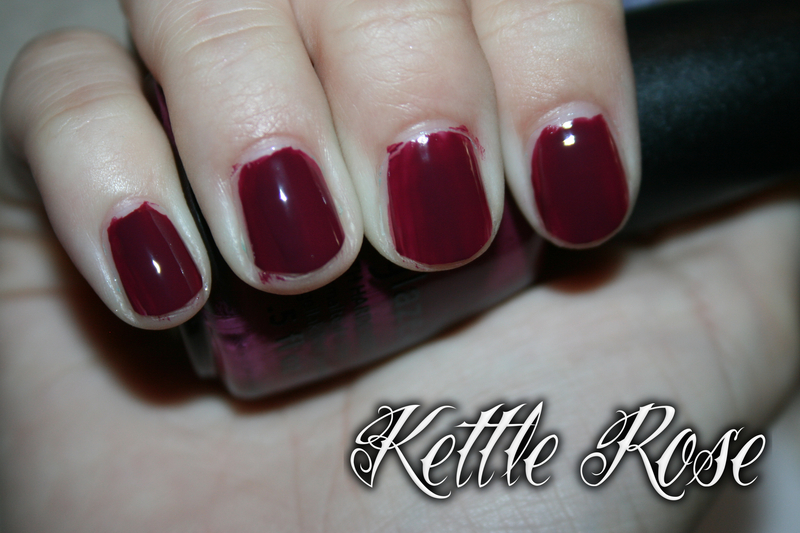 Purr-fect Plum is a dark wine color that was opaque to the naked eye in one coat, though with flash it looks uneven. Applied perfectly and a tad darker and redder than the bottle color. I actually love this color, even though I’m not a purple girl. Well, that’s all I have to say about that. Busy day tomorrow! Good night guys! Disclaimer: Products featured in this post were provided for review. All reviews are honest and in no way influenced by anything other than my experience. Go here to view my full official Disclosure Policy. OFFICIAL: China Glaze Announces Its On Safari Collection for Fall 2012! Los Angeles, CA – (May 2012): China Glaze® nail lacquer invites you to take an exotic expedition with its Fall 2012 collection, On Safari. Be captivated by the earthy tones, rich plums and celestial sparkles that make up this adventurous assortment of polishes. The China Glaze® On Safari collection will be available at fine salons and beauty supply stores nationwide in July 2012. Individual polishes retail for $7 MSRP; the 6-piece sets retail for $42 MSRP. My Thoughts: I’m so so so excited for this collection. I need Kalahari Kiss, Desert Sun, Man Hunt, Exotic Encounters, and Elephant Walk. I may be interested in the glitters, if they’re opaque. Even the reds and purples in this collection look hot! I’m so excited, I can’t wait!